District & Sessions Judge, Kailashahar Notification is out. 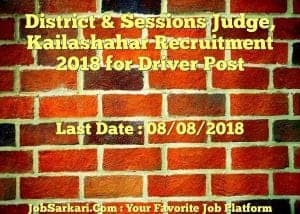 District & Sessions Judge, Kailashahar is recruiting for 02 Driver Post Posts. You can check District & Sessions Judge, Kailashahar - District and Sessions Court Kailashahar last date, download District & Sessions Judge, Kailashahar notification, visit District & Sessions Judge, Kailashahar official website and check other District & Sessions Judge, Kailashahar Vacancy details.Complete Vacancy and recruitment Details about 02 Driver Post vacancies in District & Sessions Judge, Kailashahar are provided below by JobSarkari.Com only for you. Last Date for Receipt of Application Form 08/08/2018. Mode of Payment Candidate Need to Draw a Postal Order in Favor of District & Session Judge, Unakoti Judicial District, Kailashahar Payable at Kailashahar. Driver Candidate Must Have Passed Class 10th / 12th and Posses Valid Commercial Licence With Three Years Experience in Driving Light Motor Vehicle. 02. Age Relaxation Upper Age Limit is Relaxable by 05 Years for ST Candidates. District & Session Judge, Unakoti Judicial District, Kailashahar On or Before 08th August 2018. Q. What is the Last Date For District & Sessions Judge, Kailashahar Driver Post Vacancy ? A. Last Date for District & Sessions Judge, Kailashahar Driver Post Posts is 08/08/2018. Q. 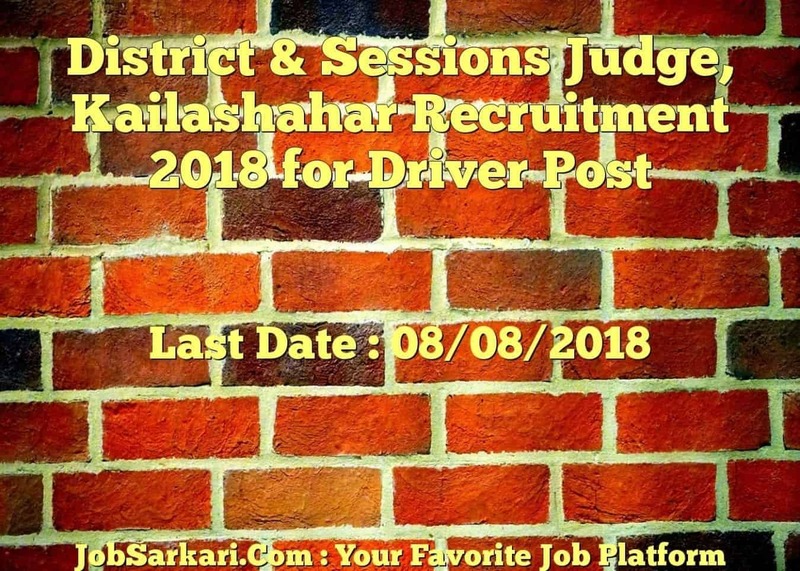 What is the Form Type of District & Sessions Judge, Kailashahar Driver Post Recruitment ? A. The Form Type for District & Sessions Judge, Kailashahar Driver Post Posts is Offline. Q. How many vacancies are available in District and Sessions Court Kailashahar Driver Post Posts ? A. There are about 0 Vacancies in District and Sessions Court Kailashahar Driver Post Posts. Q. What is the Full Form of District & Sessions Judge, Kailashahar ? A. Full Form of District & Sessions Judge, Kailashahar is District and Sessions Court Kailashahar . Meri qualifications 10+2 hai 10 me 72.83/ & 12 me 50/ or sir Mae gvt.job pana chahata hu sir mere liye btao Mae Keya Karu. Aap is link Se Sabhi 12th Pass Jobs k Liye Apply Kar Sakte Hain. Meri qualifications 10+2 hai sir Mae gvt.job pana chahata hu sir mere liye btao Mae Keya Karu. aap Is Link Se sabhi 12th Pass Govt jobs k liye Apply kar sakte hai..
10+2 SIR MAGH JOB K LIYE APPLY KR SAKTA HUU KYA MAGH HARYANA SEE HUU. You Can’t Apply For This Post.